I know 50 cent and Diddy get money but when was the last time you seen them get mobbed in the NYC? This is Pharrell cruising through Time Square with his top back. time to invest in that hard top convertible homie.....listen about 4 minutes in, people start running to his car and someone screams out "who got shot!!!" Basically everyone at the end was running to figure out if there was a star sighting or a murder seen lmao. Shout out to Lowkey. This guy filled my ipod up in a month with his blog. Tameka Foster was seen leaving her and Urshers midtown Manhattan hotel on Sept. 5th. Nicole Richie (5 months) was spotted in L.A. leaving Fred Segal after an afternoon of shopping. Earlier this month Garcelle Beauvias had her baby shower, which was hosted by her good friend, Angie Harmon. When asked about her pregnancy Garcelle gushed, "I can't believe I'm pregnant with twins! Other than seeing my body grow and thinking, 'Will my stomach ever go back?' it's a pretty exciting time," she laughed. 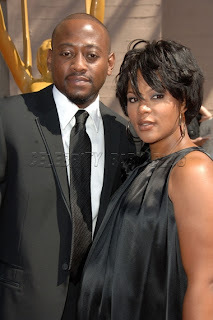 Omar Epps, 34, and wife Keisha Spivey, formerly of the R&B group Total, posed for the cameras during their arrival at the 2007 Creative Arts Emmy Awards in L.A. earlier this month. Keisha is 6 months pregnant. Three-months pregnant Halle Berry shops for baby clothes with her mother, Judith Ann, at baby superstore NoMi boutique on West Pico in Los Angeles. Over the weekend, it was announced that soul singer Aretha Franklin has Halle in mind to play her in an upcoming biopic. Aretha said, “For television. My autobiography, From These Roots. Hopefully it will happen early spring. I have verbal commitments from Billy Dee [Williams] to play my father, and Terrence Howard to play Smokey Robinson. I’m not sure yet [who will play me]. Jennifer Hudson came to read for me. I also have an interest in Halle Berry possibly doing it. And Fantasia.